It was a heck of a week last week with two amazing events that I was lucky enough to attend. First up was the Moonbeam Harvest at Clayton Early Learning Center where some of Denver’s best chefs put on their culinary best to support a deserving charity. Big shout out goes to chef Troy Guard for organizing the tasty event. They also had the environment in mind by using recyclable plastic cutlery, which was vegetable based and by having Green Up Denver providing bins throughout the event. Worth noting was the insane line for Scott Parker‘s (no relation and not the former Colorado Avalanche player) “waffle eggplant with chive butter and sweet chili syrup.” Really? I mean with a flag sign that says “eggplant” I would normally ignore, but it was TDF (to die for). The Carousel Ball to benefit The Barbara Davis Center for Childhood Diabetes on Saturday. A new car service has arrived in Denver. Lyft promises a friendly driver is just minutes away. All you have to do is download their app, tap a button and a car will on the way within minutes. Lyft launched in June 2012 and more than 1 one million rides have been shared across the country. Lyft operates in 13 cities: San Francisco, Los Angeles, Seattle, Phoenix, Chicago, St. Paul, Minn., Indianapolis, Atlanta, Charlotte, Boston, Denver, Washington, D.C. and San Diego. Technically, Lyft is a free service. Drivers use their own car, with pink mustaches on their front grill, and riders give donations to drivers and Lyft takes a cut. Lyft promises safety measures that go beyond what any taxi, limo or casual carpool has done before, including an extensive screening process, DMV and background checks and first-of-its-kind $1 million per occurrence excess liability insurance. Lyft’s Denver service started Friday. Download the app at www.lyft.me. 1515 Restaurant at 1515 Market St. is featuring a special dinner paired with craft beers beginning at 6:30 p.m. on Wednesday. A selection of exceptional beers brewed by the Goose Island Brewing Company of Chicago and Leffe and Hoegaarden from Belgium. Dessert: Peach pie, Leffe Brown “liquid nitrogen” ice cream, caramel lavender foam. For more information, email events@1515restaurant.com, call 303-571-0011 or visit www.1515restaurant.com. The lovely and talented Mary Nguyen (above), who originally opened Parallel 17 at 1600 17th Ave. is concocting a new venture called Olive & Finch at 1552 E. 17th Ave. She also owns Street Kitchen Asian Bistro at the Villagio in Englewood. The latest concept from chef/owner Nguyen is an eatery, which includes a bakery and market. Specialties include scratch-made pastries, artisan sandwiches and soups, salads, fresh pressed juices, and a coffee bar with monthly rotating beans, all with a focus on healthy options for those with allergies. 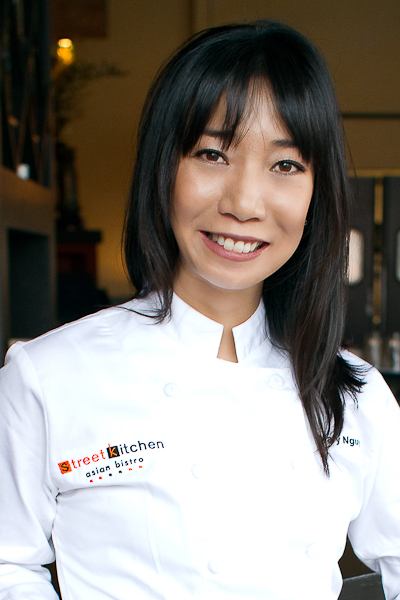 Nguyen’s pastry chef is Leslie Melland, graduate of the Culinary School at Le Cordon. Olive & Finch also will have handcrafted items for the table (linens, dish ware), fine prepared foods for takeaway, and will be providing curbside delivery, catering, boxed breakfast and lunches in addition to holiday menu planning/preparation. The space is 1,500 square feet (55 seats), and was designed by Zar Designs, with interior design by Nguyen.